Much less celebrated than Zadkine’s De Verwoeste Stad, Ongebroken Verzet (Unbroken Resistance), another war memorial, stands so very quiet and unnoticed at Kruisplein, minutes from Rotterdam Central Station. Admittedly, the area does not invite you to linger. It has been a huge construction site since 2008 when the old station building was torn down, all the trams in Rotterdam pass through here, and, overhead, urban pigeons perch on the power lines and tree branches, splattering the pavement below. Then, one day, I stopped to look at the statue properly and I was fascinated by the texture of the bronze. It looks nothing like bronze at all, but suggests roughly shaped and flattened lumps of clay, slapped together to give substance to a male figure that has literally risen from the ground. The only distinct features are the hands, the feet and the head. There is no movement in the figure. It has risen and now it stands absolutely still, its gaze raised to the sky, waiting with an impressive, quiet resilience. Unbroken. 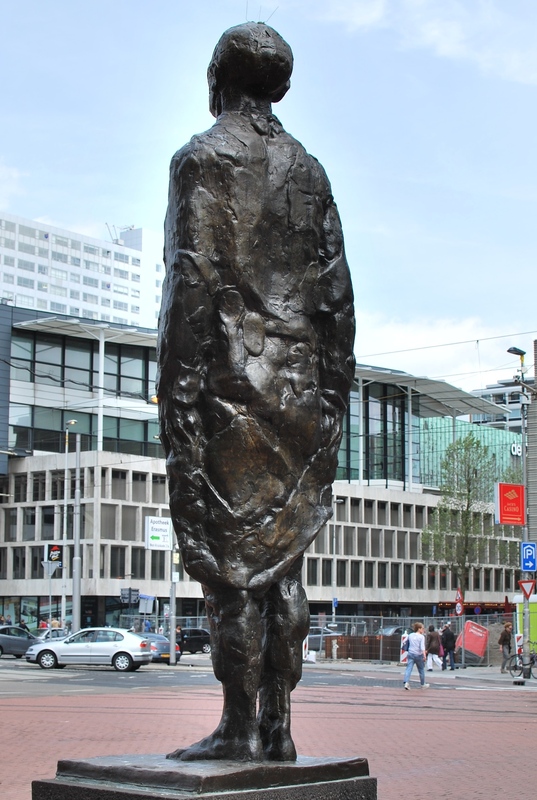 The first initiative for the statue came from an association of former resistance fighters in Rotterdam for a dignified memorial to the Dutch resistance. This plan was opposed by other associations who felt that the memorial should address the sacrifice of all people in Rotterdam, not only the underground resistance. Finally, in 1960, the sculptor Hubert van Lith was commissioned to sketch a design that would symbolize the nature and motives of the 1940-45 resistance, but also commemorate those who died in the war. The first sketch was rejected, but eventually, in June 1963, the current memorial was approved, and the statue was unveiled on May 4, 1965, twenty years after the end of the war. Reactions were muted, even disappointed. The disagreements in the years before had taken their toll. The words cut into the pedestal hint at the troubled provenance of the statue. 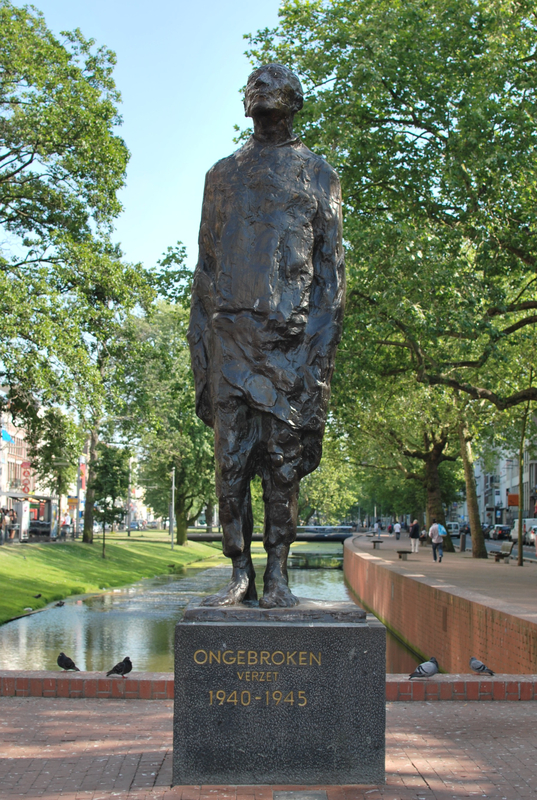 ‘Verzet’ (Resistance) is done in smaller letters than ‘Ongebroken’ (Unbroken) because it was felt that using letters of the same size would not do justice to the sacrifice of all Rotterdammers during the war. I have noticed the statue before – the key word being “noticed” – but never really bothered to find out more. Thanks for the elegant description. He is absolutely magnificent! No matter what all the problems might have been – clearly he resisted them!